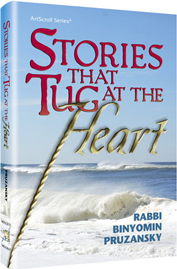 In “Stories That Tug At the Heart” Artscroll / Mesorah Publications 2009,Rabbi Binyomen Pruzansky tells a story that I once shared with him. The story is true and close to my heart. In the book Reb Binyomen changed the names of those involved to protect their privacy. With permission of the family I am putting the correct names back in. The names are part of the story! The comments in parenthesis are mine. The clock ticked inexorably toward Shabbos as Rabbi Yaacov Haber put the finishing touches on his preparations. Another hour or so, he assessed, and he would be finished. As he leafed through a brand new sefer searching for a quote he would utilize in his Shabbos morning sermon, the insistent ring of the phone pulled him away from his task. “No, Rabbi, I’m sorry, but this really can’t wait,” Jarom replied firmly. “I need to speak to you today.” Clearly, Jarom Haber, whoever he was, would not be taking “no” for an answer. “In that case,” Rabbi Haber conceded, “come right over.” He gave Jarom his address and returned to his work, hoping he would be able to finish in the half-hour it would take for Jarom to reach him. Methodically recalling the names and faces of former members of his Monsey shul, he tried to put a face to the name Jarom Haber. However, he had no memory of anyone by that name. The mystery was soon settled by Jarom’s arrival. Entering the foreign territory of the Rabbi’s study, Jarom appeared a bit tenuous. His tall, broad frame was a bit stooped, as if he were carrying a heavy bundle on his back. Yet one could see that such was not his normal bearing; his direct, blue-eyed gaze, the thick, tousled shock of sandy brown hair and deep laugh lines framing his mouth created the image of an energetic, self-assured man. “Well, I just have to preface it by explaining to you that even though I was born Jewish, I am an atheist. Not just an atheist, but you might say I’m a professional atheist. I’m a professor at Rockland Community College, and I teach courses on atheism. In fact, I’ve written several books on atheism. “The reason I came to you is because this morning, I went to my doctor to receive the results of some tests, and he informed me that I have pancreatic cancer. I don’t know if you know anything about pancreatic cancer, but it has an almost-zero survival rate, and mine is already in a very advanced stage. In a few weeks or at best, a few months, I’ll be finished. There’s nothing for me to do about it. Observing the lively spark in Jarom’s eyes as he spoke, Rabbi Haber could hardly believe that he was speaking to a terminally ill man. Nevertheless, he was aware that this particular disease often progressed rapidly, and he had no doubt that the situation was dire. Jarom was like a drowning man struggling to find something to hold onto, begging Rabbi Haber to throw him a lifeline. “What comfort is there for an atheist facing death?” the Rabbi wondered. “How alone he must feel with his fears and pain!” Regardless of Jarom’s lifelong misconceptions, however, Rabbi Haber knew that G-d was indeed there for him. The challenge was to convince Jarom that this was so; that he, like any other person born into this world, had the ability to call out to G-d for help. Jarom drummed his fingers on the armrest of his chair and rolled his eyes upward as if searching the ceiling for an answer to the question. He had never considered his level of certainty about his beliefs. Now, using nothing but his own considerable power of logic, he had to admit that his atheism (or anything else for that matter) was not a 100 percent certainty. If it were, why would he be sitting in a rabbi’s office? “Well, I guess I could say that there’s a five percent possibility that there’s a G-d,” Jarom replied cautiously, as if the very proclamation might cause some unseen cosmic cataclysm. These were not words he had ever expected to hear from his own mouth. The Rabbi’s words painted a picture in Jarom’s mind. There was a splendid palace, and Jarom stood outside it, facing a window that was open just a few inches. From that little crack at the bottom, Jarom could sense the majesty and power residing within. He didn’t own a key to the palace; the guards didn’t know him at the gate, but he would pray through that narrow opening, and his words would be heard. Jarom Haber’s words would reach the ears of G-d. Jarom’s cool façade crumbled as he pictured himself, a lost child trying to get his Father’s attention, calling through the window from outside. “Do you know how to read Hebrew?” asked Rabbi Haber. Thanks to a few years of Hebrew school in Jarom’s pre-bar mitzvah years, he had indeed learned alef-bais. With a small measure of pride, he answered, “Yes, I do.” “Alright,” said Rabbi Haber. He took a slim volume of Tehilim off the top of his desk and handed it to Jarom. “Let’s start right now, then, by saying this chapter of Tehilim.” Jarom took the sefer into his hands. He had handled thousands of books in his life as an academic; some of the volumes were rare antiques. Yet now, handling a simple volume of Tehilim, his hands trembled. He began to haltingly read the chapter Rabbi Haber designated, all the while imagining that slightly open window, and hoping that inside the palace, his praises were being received with pleasure. When Jarom finished his recitation, Rabbi Haber helped him understand the meaning of what he had said. The words were full of encouragement and comfort, stirring in Jarom the beginnings of a sense of trust in G-d. No longer was the issue whether or not G-d existed; he had prayed and felt certain that his words were heard. Now the issue was how to build a relationship with G-d in the short time he had left. “I think the most important thing we could do at this point is to learn some Torah together,” Rabbi Haber suggested. Jarom agreed, and they arranged to spend 15 to 20 minutes a day learning. “What is it that you would like to learn Jarom?” Jarom had no ready answer. He was not sure where to find what he felt he needed in this crucial period of his life. He wanted a little time to consider the possibilities. On Sunday morning, Jarom called Rabbi Haber. He had done some reading and some thinking, and had decided. “I want to learn the laws of repentance,” he told the Rabbi with conviction. Rabbi Haber was moved by the man’s sincerity. Indeed, all he wanted now was to get his affairs in order both in this world and the next. Like a man moving to a new home after many long years, Jarom wanted to shed all the useless items he had accumulated and go forward carrying only that which he would need. Starting that day, Rabbi Haber and Jarom became learning partners, poring over the Rambam’s laws of Teshuvah (repentance) with depth and focus. Jarom’s scholarly abilities were turned in a new direction, exactly 180 degrees opposite of the path he had pursued throughout his life. Rabbi Haber enjoyed the challenge of Jarom’s insightful questions, and marveled at his quick grasp of the concepts they learned together. As expected, Jarom grew weaker by the day. His athletic build began to shrivel, his posture to droop; his bright, intense eyes contrasted eerily with his pale face. Finally, too weak to deliver his lectures, he was forced to resign his teaching position. Nevertheless, Jarom persisted in his journey toward G-d. He purchased tzitzis and a yarmulke and began to wear them. Every day, he put on his tefillin and prayed as well as he could, injecting the overflowing contents of his heart into the Hebrew words he was just beginning to master. Rabbi Haber watched with mixed emotions as his new student’s Torah learning blossomed and flourished, and his physical presence withered away. One morning, as Rabbi Haber and Jarom learned together, they reached a point in the Rambam’s work that describes the process of complete Teshuvah. “The final step,” Rabbi Haber explained, “is when a person has the opportunity to commit the same sin again, but he holds himself back and refrains from doing it.” “There isn’t enough time left in my life for me to revisit every sin I’ve committed,” Jarom commented somberly. “I wish there was some way I could do a complete Teshuvahh, but I’m afraid that’s just never going to happen.” The weeks passed quickly, and as they did, Jarom’s condition deteriorated further. He and Rabbi Haber completed their study of the Rambam’s work, but Jarom continued to pay frequent visits to his mentor. A few weeks later Jarom passed away. He left this world as a Torah Jew whose lips had uttered prayers, whose keen mind had been rededicated to Torah learning, and whose longing for repentance had been satisfied. Rabbi Haber said in his public address at Jarom’s funeral, “Jarom Haber died as a great Jew.and his story is a lesson for all of us”.